You may want to discuss with your students how this ecosystem type appears to differ from other tropical ecosystems such as tropical dry forests, or savannas -- and how this tropical rainforest looks like rainforests in other regions of the world, although they may have few or no species in common. Mature individuals of many tropical rainforest tree species have large, flaring buttress roots, such as those displayed here. 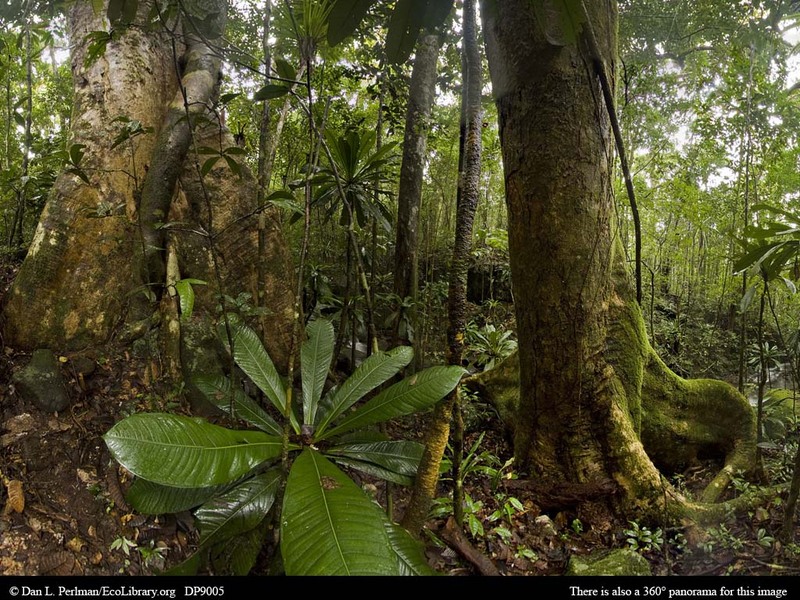 In addition, these forests often have many lianas, the thick woody vines seen in this panorama. Madagascar, the world's fourth-largest island, is also one of the world's biodiversity hotspots. The island has a land mass about the size of Montana and Idaho combined, and at its closest is little more than 300 miles (500 km) from Africa--yet it has been isolated from the continent for approximately 160 million years. The vast majority of the island's species are endemic (found nowhere else in the world) and the native ecosystems are under heavy threat from human encroachment, especially deforestation for subsistence agriculture. The island contains several very different ecosystem types, ranging from tropical rainforest in the northeast through shrublands and dry forests to spiny desert (or spiny forest) in the south. Many ecologists agree that as an ecosystem type, spiny desert is itself endemic, that there is nothing else like it in the world. The table below, with data from Conservation International, shows just how high a proportion of Madagascar's species are found nowhere else on earth. In fact, many of the island's species are endemic to just a single ecosystem type or even just a small portion of an ecosystem type. Conservation International. Madagascar and the Indian Ocean Islands. Click here to read about this biodiversity hotspot.